You have selected a late pick up time. We can't guarantee you'll arrive in time for check-in. We will not be held responsible for any additional costs incurred. Do you wish to proceed? Save yourself the hassle and stress of trying to navigate unfamiliar roads. Con-X-ion provides a swift and efficient return transfer option from your accommodation to your favourite fun parks!. The convenient Airport/Theme Park and Attraction transfer pass that gives the Traveller choice and flexibility and saves $$$. Valid for 30 days from first use of travel, the RooPass can be utilised any day within that 30 day period. Options available are 1 - 7 transfer passes including return Brisbane or Gold Coast Airport transfers. Passes will include transfers travelling inbound to Gold Coast Hotel Accomodation only. Con-X-ion are leaders in the field of transportation specialising in door to door airport and cruise terminal transfers, theme park and attraction transfers, Day Tours and all Charter services. With over 25 years experience they are a trusted and reliable source for all of your transportation needs within Australia. Con-X-ion provide the most frequent and direct shuttle transfer service to and from Gold Coast, Brisbane, Sunshine Coast, Sydney, Melbourne and Cairns Airports to accommodation houses or local residences. Con-X-ion meet all major flights and provide charter options for travellers arriving outside of scheduled service times or for those requiring a premium service. Con-X-ion invite you to sit back, relax and be transferred in comfort! With over 30 years of experience in the field of transportation, Con-X-ion is a trusted provider of direct airport shuttle services within Australia. We also provide charter options and premium transport services in various parts of Queensland, as well as Sydney and Melbourne areas. Our mission is to provide timely, comfortable, and convenient way to travel for each of our customer. Our proven track record as a direct shuttle and private transport and our unmatched customer service are what sets Con-X-ion apart in the industry. Service excellence for more than 30 years, completed 10 million transfers -- and counting. Con-X-ion have been a leader in transportation for over 25 years, providing the most frequent and direct door to door shuttle transfer service from Brisbane, Gold Coast, Sunshine Coast, Melbourne, Sydney and Cairns Airports to and from your accommodation or private residence. 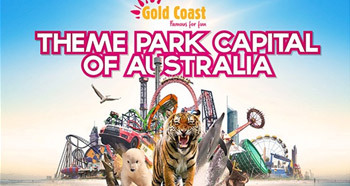 The Gold Coast is not just famous as a tourist hotspot, but also for being the theme park capital of Australia. Don’t miss the opportunity for a fun and adventurous day out for you and your family, by booking your Con-X-ion theme park transfers and entry tickets today. 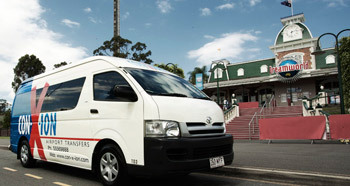 Con-X-ion are positioned as primary transport providers in the field of group transportation within Australia. Specialising in providing group/airport transfers, day tours, wedding, dinner and golf transfers. Take advantage of the Con-X-ion Roo Pass which provides flexible transfer solutions during your stay on the Gold Coast. Con-X-ion provide return shuttle transfer services daily from your accommodation venue to one of Sunshine Coast’s leading attractions – Aussie World! Become an X-points member and be rewarded each time you travel! The X-points loyalty program is designed to streamline the booking process and reward our valued customers with points, which can be redeemed for free travel. By becoming an Airport Con-x-ion Franchisee, you will be in business for yourself, but never by yourself. The discount will be automatically applied to your booking at checkout.